Does your team need new sideline chairs? 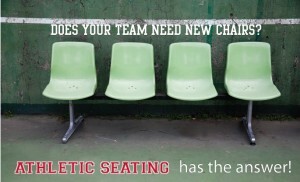 In the market for some new Sideline Chairs or Locker Room Chairs and Stools?Athletic Seating is your one stop shopping for your team’s seating needs. With top quality seating products, and our exclusive state of the art logo printing process, your teams name and logo will never look better! Think all printing is the same?…not at all. Ask us for a samples of our process and the way all others use digital printing process and you’ll be amazed by the difference. We’ll be happy to send you samples of both, then you be the judge. Sideline chairs and stools are not a small investment by any means, so why wouldn’t you want your team’s logos to stand out, not just “be on the chair”? We offer the finest logo printing in the industry, and since we are the only dealer to do that, we can also save you money since we have no middleman mark-ups. And, our quality seating products are made in the USA…..not overseas.